The TechDAS Air Force III is a new model developed by extracting the essence of their reference model, the Air Force One, complete with system upgradability. The TechDAS team is very pleased to present Air Force III, meeting a wide range of demands from many customers, while preserving almost the same qualities and performance of the reference model, Air Force One. To achieve such a goal, this new model has been developed by extracting the essence and key features of the reference model so as to offer flexibility and allowing for system upgrades, and to operate with a wide range of equipment, from high end to low-cost. The main frame, where the platter rides, has a minimum size and is made of solid aluminum by precision cutting, just like with the Air Force One. 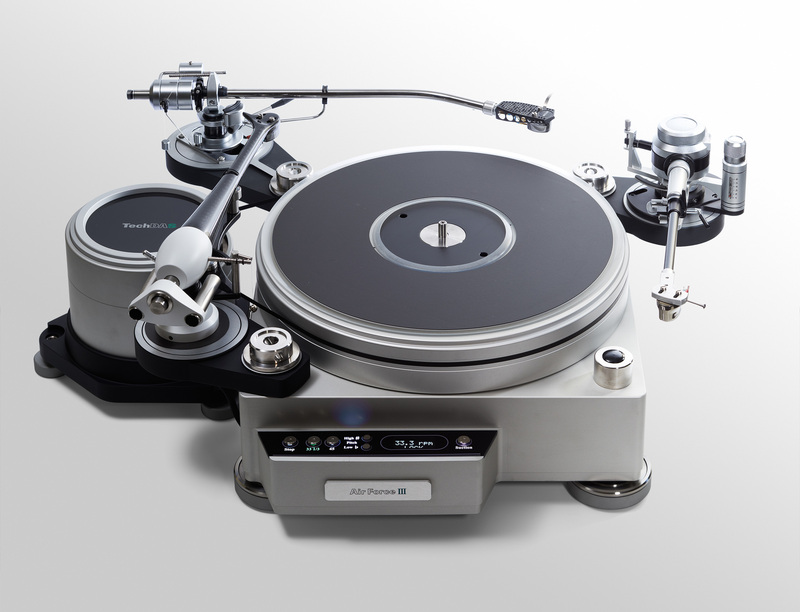 Up to 4 tonearms, ranging from short (9”) to long (12”) tonearms, can be fitted to the frame. 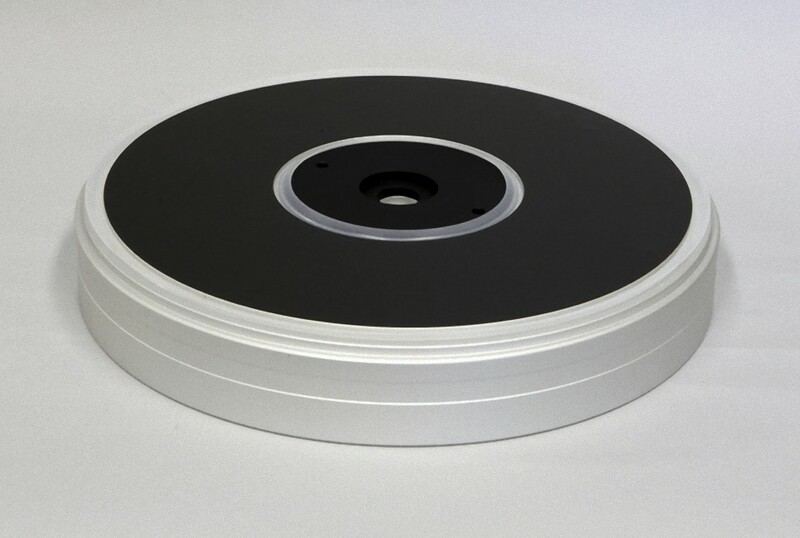 The basic type platter is made of high mass solid aluminum. Other types of platters are to be developed and will be available as options for customers who want a system upgrade. 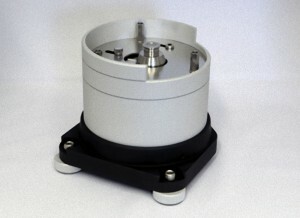 Instead of having built-in insulators, the turntable sits on four feet, using a pin point support method with a sufficient howling margin within an appropriate installation environment. For an environment that needs a larger howling margin, an insulation table based on air insulation technology will be available. 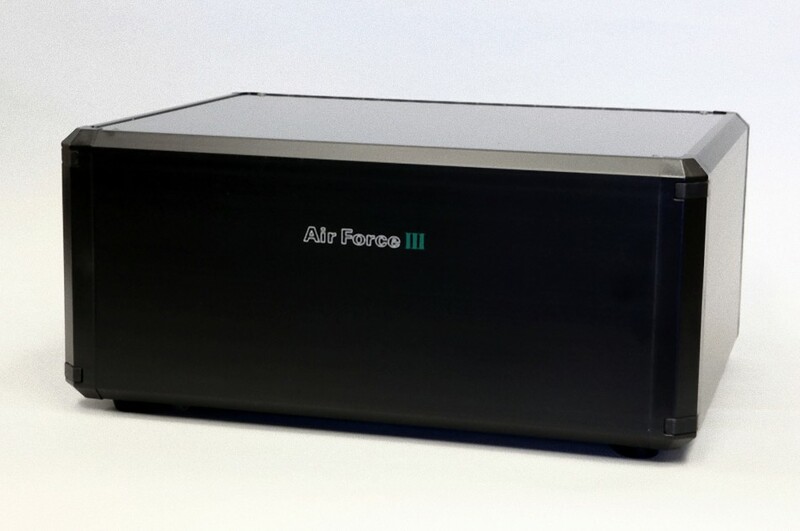 Above all, the Air Force III has the core air control technologies of the Air Force One, which are air bearing which enables a platter floating of 30µm along with a vacuum hold down of the disc. Fulfils a reproduction of music with background silences by thoroughly eliminating unwanted vibration. Has the core air control technologies transmitted from the Air Force One. Sits on four height-adjustable feet employing pinpoint support as well as lowering the center of gravity. High mass main frame that weights 18 kg, despite its small size, and is made of solid, precision-cut aluminum. High mass platter that weighs 9 kg and is of solid, precision-cut aluminum, as is the main frame. 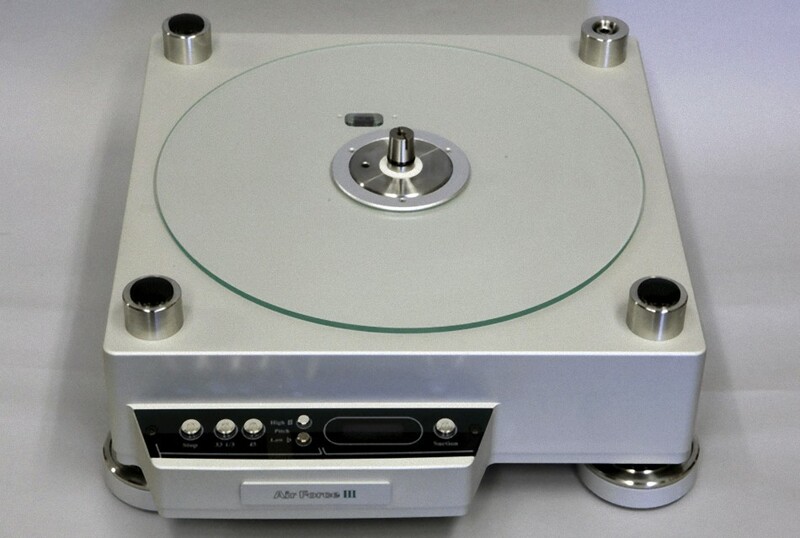 Up to 4 short (9″) to long (12″) tonearms can be mounted because of the small size of the main frame. Designed to offer flexibility for system upgrades with various accessories, different platter options, and an exclusive insulation table to be released subsequently. Ripple-free, low-vibration,silent air pump, which has been transmitted from Air Force one. Stable and accurate rotation speeds of 33 1/3 and 45 rpm can be achieved free from secular changes or temperature affects by the low rotation motor, where speed is controlled by a high precision oscillation circuit also used in mobile phones. Pitch control of ± 0.1 rpm is available for those who have a sense of absolute pitch. 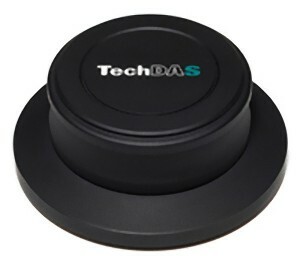 The ultimate MC phono cartridge by TechDAS: TDC01 & TDC01 Ti.